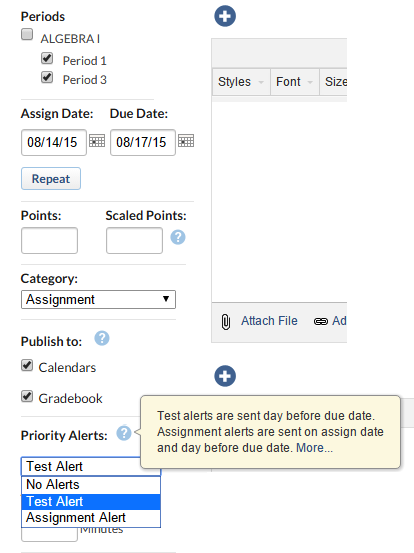 When posting an assignment, teachers can also schedule a Priority Alert for parents. Alerts are delivered to parents using the SchoolLoop Mobile App or (if the Call Alert feature has been enabled) by a phone call to unregistered parents. No Alert: This is the default choice for all assignments. No parent will receive an alert. Test Alert: Parents receive an alert about a test the day before it is due. Example: "Vanessa has a test tomorrow in English III." Assignment Alert: Similar to the Test Alert, except that the system sends an alert the day the assignment is assigned and then again the day before it is due. Example: "Vanessa has The Crucible Essay due tomorrow in English III."